Half of students aged 13 to 15 worldwide – around 150 million – report having experienced peer-to-peer violence in and around school, according to a new report released by UNICEF yesterday. Globally, slightly more than one in three students aged 13-15 experience bullying, and roughly the same proportion are involved in physical fights. Three in 10 students in 39 industrialised countries admit to bullying peers. Nearly 720 million school-aged children live in countries, including Sri Lanka, where corporal punishment at school is not fully prohibited. In Sri Lanka, 43.8% of students aged 13 to 17 were involved in a physical fight one or more times in the past 12 months, out of which 54.9% of cases were boys. 39.4% of Sri Lankan students aged 13 to 15 had been bullied one or more days during the 30 days before the survey, out of which 50.2% were boys and 28.8% girls. A study conducted by the National Child Protection Authority also found that, 80.4% of students reported having experienced at least one episode of corporal punishment in the past term. 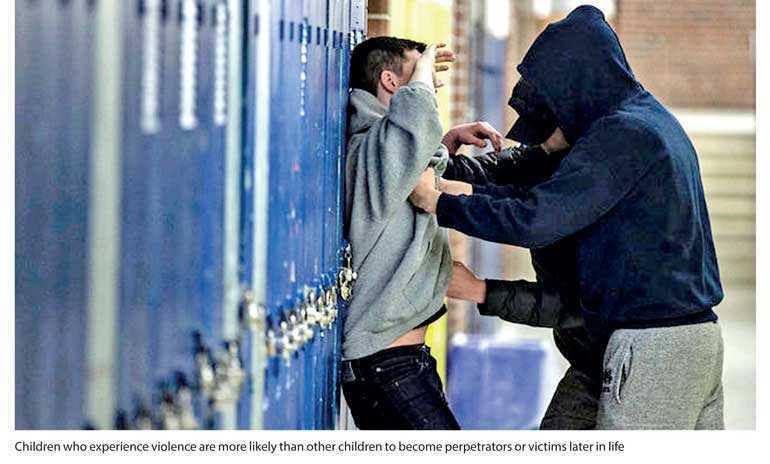 “What we need to understand is that violence impacts children and young people in many ways. And particularly for children in schools it has far-reaching consequences, such as decreased self-esteem and inability to learn and succeed. Some may even drop out of school altogether – ultimately making school an unpleasant place,” said the UNICEF Representative for Sri Lanka, Tim Sutton. According to the UNICEF global report, the cost of not acting is unacceptably high – for children, their families and communities, and for society as a whole. Toxic stress associated with violence in early childhood can impair brain development and damage the nervous system. Furthermore, children who experience violence are more likely than other children to become perpetrators or victims later in life. An Everyday Lesson: #ENDviolence in Schools is released as part of the UNICEF #ENDviolence global campaign. It is also part of a collective effort to shed light on and spark action to #ENDviolence in and around schools by organizations including UNICEF, the United Kingdom’s Department for International Development (DFID), UNESCO, other members of the Global Partnership to End Violence Against Children and UN Girls Education Initiative (UNGEI). The global call for action amplifies one of the key recommendations by the UN Committee on the Rights of the Child, which called for Sri Lanka to prohibit corporal punishment by law, in all settings, repeal any legal defence, and to ensure that these laws are effectively implemented. UNICEF is encouraging young people around the world to raise their voices to #ENDviolence in and around schools by holding a number of #ENDviolence Youth Talks around the world including in Sri Lanka. This will give young people a platform to share their experiences of violence and voice what they need to feel safe in and around school, which will inform a set of recommendations to global leaders.